Visa's are required for all visitors and should be obtained in advance from an Eritrean Embassy or Consulate before entering Asmara. To obtain your visa, you need to bring your passport, valid for at least six months from your date of visa application and one recent passport-size photo. For visa extensions you will need a photo. A fee must be paid in euro's or dollars. The original visa can be renewed twice. Extension of your visa should be arranged before your visa for Eritrea expires. Immigration Department tel. 118380, visas tel. 162154. Be sure to get updated information from an Eritrean Embassy if you are planning to travel to Eritrea. You are kindly advised to visit the office of the Eritrean Ministry of Tourism (Harnet Avenue, Asmara) to inquire for necessary documents to travel through Eritrea (Foreigners Permit to Travel, which can be obtained from the Tourism Service Center. Harnet Avenue Asmara or from any regional administration). To visit monasteries of the Eritrean Orthodox Church (e.g. Debre Bizen and Debre Sina), the visitor needs a permit issued by the Patriarchate of the Eritrean Orthodox Church (Warsai Street, Tiravolo Asmara, telephone 182098 or 182199) for 150 Nakfa (2007). 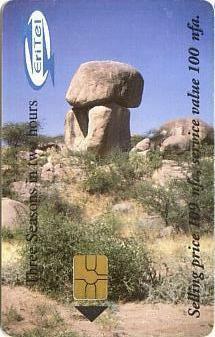 To visit Eritrea's archaeological sites, the visitor needs a permit issued by the National Museum (close to the Selam Hotel, telephone 1122389) for 150 Nakfa (2007). A permit to visit the Dahlak Islands can by obtained from the Ministry of Tourism in Massawa (Taulud Island, telephone 552797) for 300 Nakfa (2007). 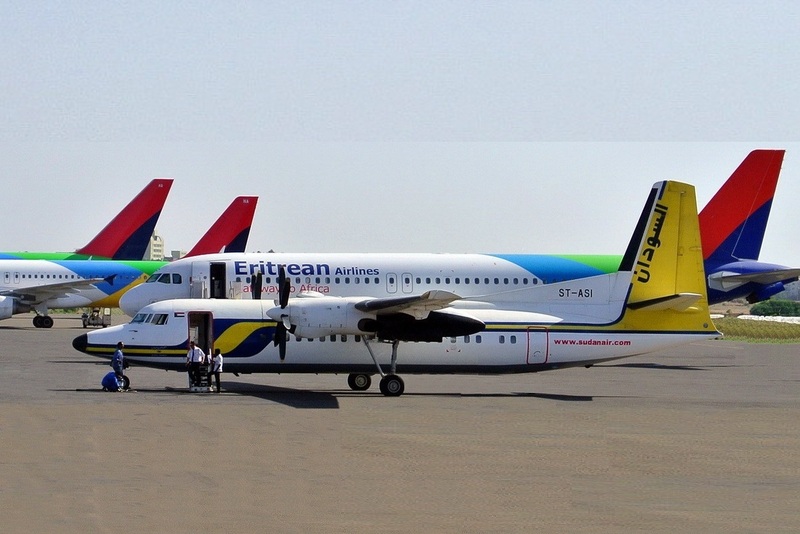 Eritrean Airlines & Sudan Airways - Asmara International Airport. 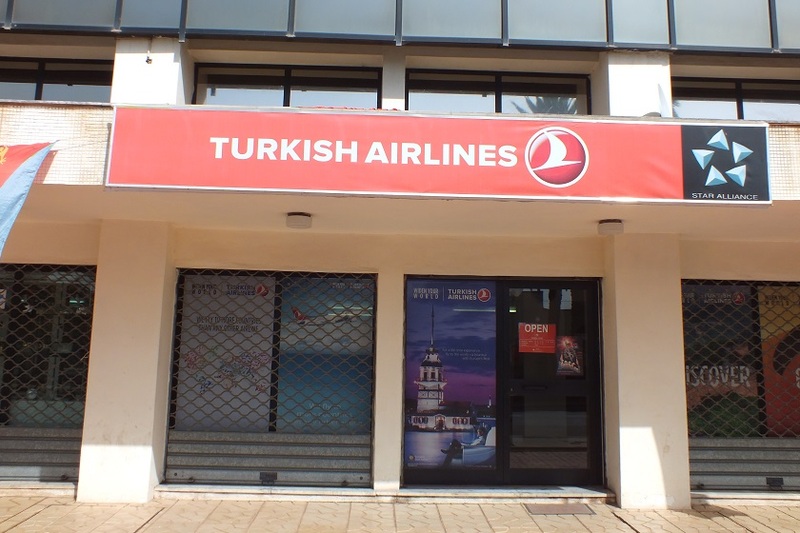 Turkish Airlines Office - Warsay Street Asmara Eritrea. 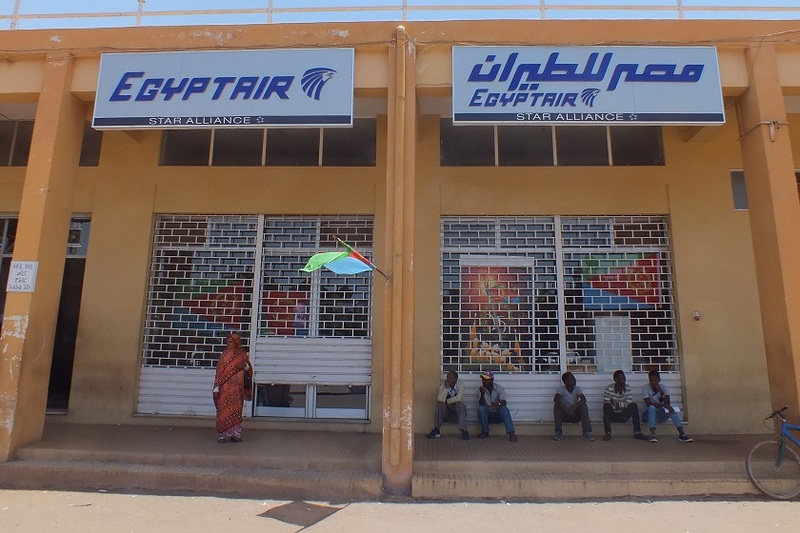 EgyptAir Office Bahti Meskerem Mall - Asmara Eritrea. 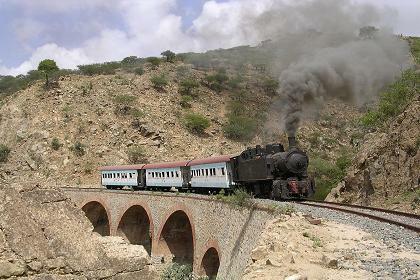 Eritrean Railways successfully rehabilitated part of its historic railway service. The 117 kilometer line between Massawa and Asmara was completed in February 2003. There are currently at least eight locomotives in working order. The railway is a proud symbol of unity, perseverance and a triumph of engineering for all the people of Eritrea, and one of the world's most spectacular journeys for railway enthusiasts, looking for new adventure. The sharp decrease in altitude within a short distance is one of the unique characteristics of the railroad. The scenery also changes with the rise of altitude. 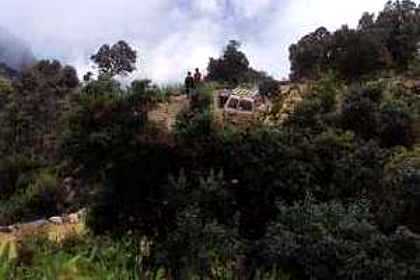 The vegetation changes from scrub bush and sand near Massawa, to pine trees near Asmara, with prickly pear cactus covering many of the cliff sides between. Since the train is not competitive to bus transport, there is no regular service. The trains can be chartered by groups. Apart from its chartered services, Eritrean Railways has began to provide round trip services from Asmara to Nefasit and Arberebu on Sundays. More information: Eritrean Railways (phone 00291 123365 fax 201785) or one of the official tour operators in Asmara. 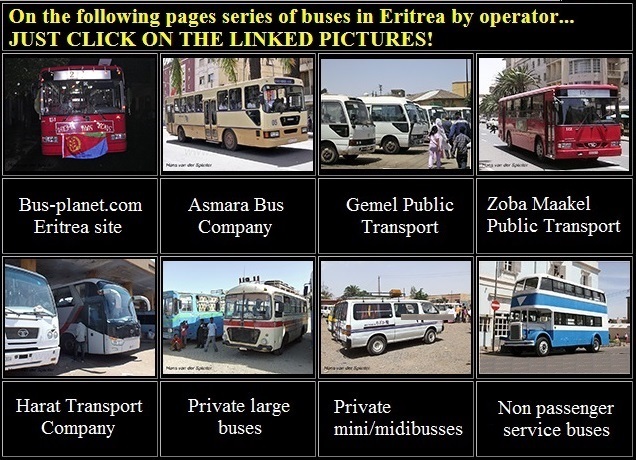 Intercity transport in Eritrea by public bus - main routes. Intercity buses are reasonably comfortable and certainly affordable. Harat Transport Company provides modern, efficient and fast expanding public transport services throughout Eritrea. Private buses of all ages , sizes and origin provide complementary transport services for an extra fare. But there is no set timetable. You pay for your ticket and just wait until all seats are occupied, and the bus will depart. For some of the long distance buses advance reservations are recommended. For comprehensive information on public buses in Eritrea and taxi's please visit our Asmara buses page and www.bus-planet.com (Eritrea pages). Eritrea has two major ports on the Red Sea, Massawa and Assab. A car/passenger ferry floats once a week between Massawa and Jeddah, Saudi Arabia. You can hire a boat in Massawa for a trip to the islands or for diving in the Red Sea. 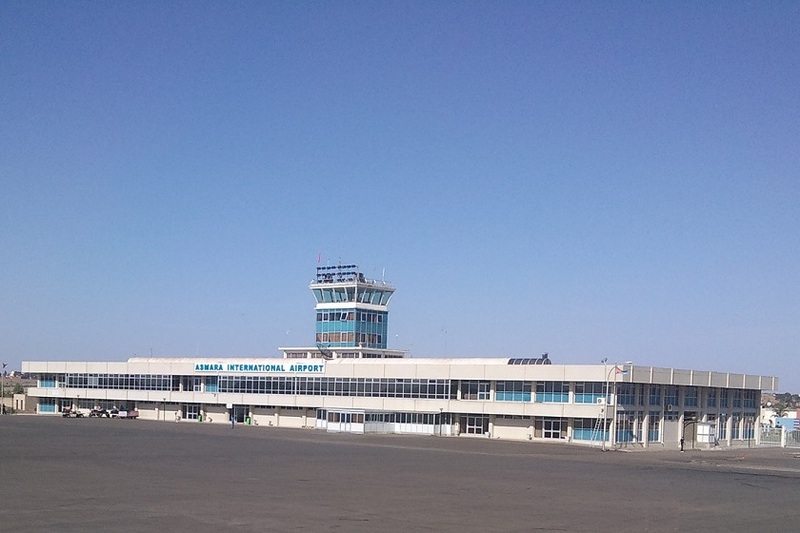 However, you need permission to visit the islands by the Eritrean Shipping Lines representative in Massawa. If you are on an organized tour through an official tour operator, the permits should be arranged for you. Eritrea has a good network of roads. Asphalt all-weather roads connect the capital city Asmara with one of the principal Eritrean ports, Massawa, and several other provincial towns. In addition, there are hundreds of kilometers of all-weather dirt roads linking other villages of Eritrea. Over long distances in Eritrea, cars can be twice as quick as buses. 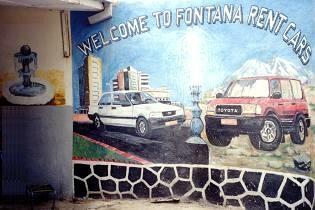 Africa Rent Car and Fontana Rent A Car have the largest fleet of cars available for hire starting with $60 per day for a saloon car (only adequate for traveling from Asmara to the coast, to Keren or to the south) up to $200 for a Land Cruiser. Driving is on the right-hand side of the road and a valid international driving license is required. In some areas driving at night is prohibited. Fuel is easily obtainable everywhere. All prices include insurance and maintenance services. All 4WD vehicles come with driver (included in price). 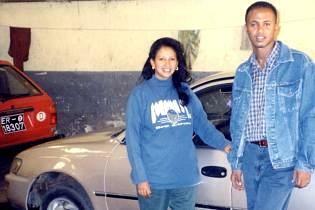 We provide drivers for other cars at clients request for 300 Nakfa per day/driver. 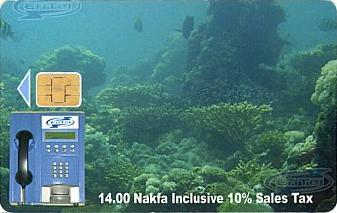 For trips to Southern Red Sea, additional 1000 Nakfa for 4WD vehicles will be charged. The hirer shall refill the tank to correspond the initial page of fuel indicator reading (or fuel will be charged). 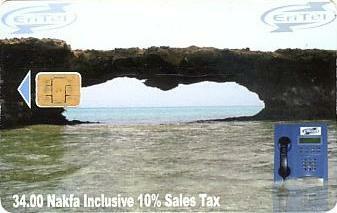 10% sales tax will be added to the final invoice. All cars have passed annual road safety test, given a certificate and a new plate by Road Transport Authorities. Toyota Land Cruisers are always rented with our driver and driver fee is included. 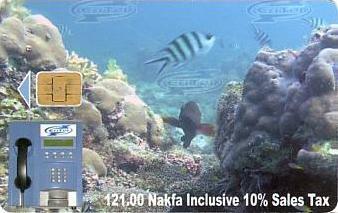 If the Toyota Land Cruisers are needed for the Southern Red Sea Trip, 1000 Nakfa per day is added. If the Toyota Corolla / Corona and Honda / Nissan are ordered with driver, 250 Nakfa per day is added. Diesel: we deliver with a full tank, and when you return it, you will pay to refuel it to full. 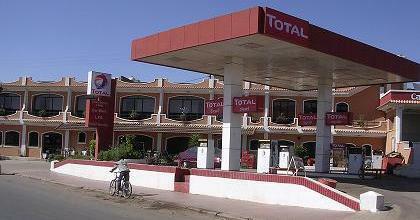 Petrol: we deliver with a full tank, and when you return it, you will return it with a full tank. 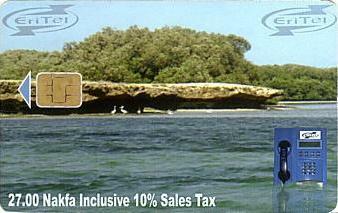 10% service tax is not included in the prices listed. Diesel 20 Nakfa and petrol 30 Nakfa per liter. Traveling through rough Eritrea with a Toyota Land Cruiser. Although the bicycle is popular in Eritrea it is not usual to rent them to tourists. The main streets in the center of Asmara are closed for bicycles. Entering them is prohibited and trespassers may be fined. The bicycle will be confiscated. These rules date from the time when the Eritrean resistance harassed Ethiopian targets and collaborators using their bicycles. The Ethiopian authorities then banned these bicycles from the center of Asmara. The rules survived more then ten years of liberation. If you decide to rent a bike, be prepared to pay the equivalent of two dollar per day (long term rent) or three dollars for one day. Test the bike before renting it. Brakes are important if you are planning the bike in mountainous areas! 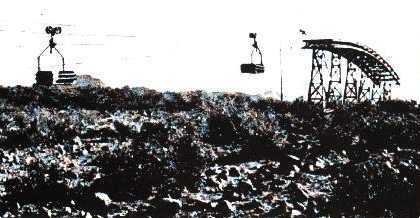 The Italians also built a cable-car line. This was the longest cableway in the world and was used to transport supplies direct from the port in Massawa to Asmara city center (75km). It had 1,620 trolleys, each 100m apart and able to carry 300kg and moved at 9km per hour. It could carry 720 ton of goods per day. It did take passengers as well. It suffered extensive damage during World War II and was looted of materials by the British 'caretaker' administration of 1941-52, which sold the metal as scrap to Sudan and Pakistan. Horse-drawn gharis and camels are also plentiful although they tend to be used functionally rather than as transport for tourists. Public telephones are easy to find in Eritrea's major city's. 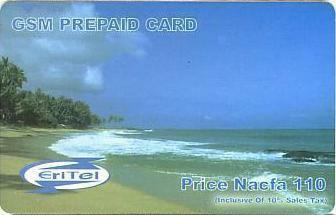 Although coin phones are available, it is more convenient to use telephone cards, which are available from the telecommunications offices in service values of 14, 27, 34, 62 or 121 Nakfa. At the telecommunications building in Harnet Avenue, you can make international calls. There is a rapidly expanding number of places offering Internet access in Asmara, Keren and Massawa. 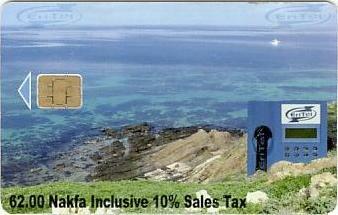 the charge is 20 Nakfa per hour (October 2014). Connections are slow. TSE Cyber Cafe (Telecomunications Office) and TFanus Enterprises offer the best internet connections in Asmara.